Wetted Materials: 316 SS chamber with FEP diaphragm and Buna-N O-ring standard. Fluoroelastomer or EPDM O-ring optional. Temperature Limit: 275°F (135°C). CSA approved: -20 to 90°C (-4 to 184°F). Pressure Limit: 1500 psig (103 bar). Enclosure Rating: UL listed explosion-proof, Class I, Groups B, C, and D. Class II Groups E, F, and G. Meets NEMA 4X (IP66). CSA optional. Class I, Groups B, C & D. Class II, Groups E, F, & G -20°C ≤ Tamb ≤ 75°C T6 [optional -20°C ≤ Tamb ≤ 40°C T5] Type 4. Switch Type: Two SPDT snap switches. 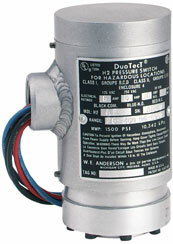 Electrical Rating: 5 A @ 125/250 VAC, 5 A res., 3 A ind. @ 30 VDC. Gold contacts or 10 A switch optional. Electrical Connections: 18 AWG, 18" (460 mm) long. Conduit Connection: 3/4" female NPT. Process Connection: 1/4" female NPT. Set Point Adjustment: Internal nut. Weight: 2 lb (.9 kg). Deadband: Approximately 10% of range. Agency Approvals: CE, CSA, UL.